When you have been hurt in any type of accident, the road ahead may seem confusing and uncertain. Your injuries could be affecting you and your family in ways you never considered before. For example, if your injuries have made it impossible for you to work, you may not be able to afford to maintain the standard of living to which your children have become accustomed. At Hoggatt Law Office, P.C., we are proud to help injured accident victims seek appropriate compensation for their injuries. Whether you have been hurt at work or in a traffic accident, our skilled attorneys will provide the guidance you need throughout the legal process. According to Colorado law, employees who are injured in the course of performing their jobs are usually entitled to collect benefits through the state’s workers’ compensation system. Unfortunately, employers and insurance companies often place saving money above the needs of an injured worker. Claims may be denied or payment may be delayed for a variety of reasons, but we can help you take control of the situation. Accidents involving fire and explosions. If you have been injured at work, contact our office right away. You only have a short window of time in which to file your initial claim. Accidents involving Uber, Lyft, or other ridesharing vehicles. We also represent the surviving family members of deceased victims in wrongful death actions. No matter how complex your case may seem, our attorneys will fight to get you the compensation you deserve. At Hoggatt Law Office, P.C., we work hard to uphold the trust that our clients place in us. We know that recovering from your injuries can be a long and difficult process, but you do not need to go through it alone. When you choose our firm, you are treated like a member of our family. Your priorities become our priorities, and your goals become our goals. You can rely on us to provide the skilled representation you need from the beginning of your case until the end. We have recovered millions of dollars in settlements and verdicts for our clients, and we look forward to helping you secure a favorable outcome as well. To learn more or to schedule a free consultation, contact our office. Call 970-225-2190 to schedule an appointment today. 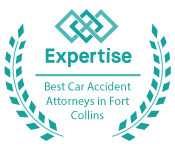 Our firm serves clients in Boulder, Boulder County and throughout northern Colorado.